I was told by a Brazilian friend of mine that the word Saudades exists exclusively in Portuguese. There’s no one word equivalent in English, but in an attempt to describe the meaning it’s something like a more potent version of nostalgia. A longing or feeling of emptiness for something that you no longer have in that moment. And it seems the entirely right word to use to explain the way I feel about the amazing place I’ve recently had the chance to explore. I was incredibly underprepared for this trip and it was entirely my fault. The nine months of bitter winter finally ended in London this May, and in true British style I spent most of the month before I left for Brazil in various pub gardens celebrating the start of summer. This meant that by the time June 1st rolled around, I boarded a flight to Rio with only a backlog of hangovers and a backpack full of bikinis. I am very lucky that my dear friend and South American travel expert* Blake, had organised everything for us. I do normally do my research, so I wasn’t being entirely reckless. However, for once, and as it was Blake’s idea in the first place (he told me there was no room for compromise) I just did as he suggested, no questions asked. It certainly paid off. I would thoroughly recommend it, but you may want to pick that sort of travel companion wisely as it’s an approach with potential for disaster! So, let me start with the information I should have known when I arrived in Brazil. The route of emotions is in the north east of the country. The climate is very different to the famous cities of the south like Rio and São Paulo. Arguably, the best time to visit the area and the main tourist season is June until August. 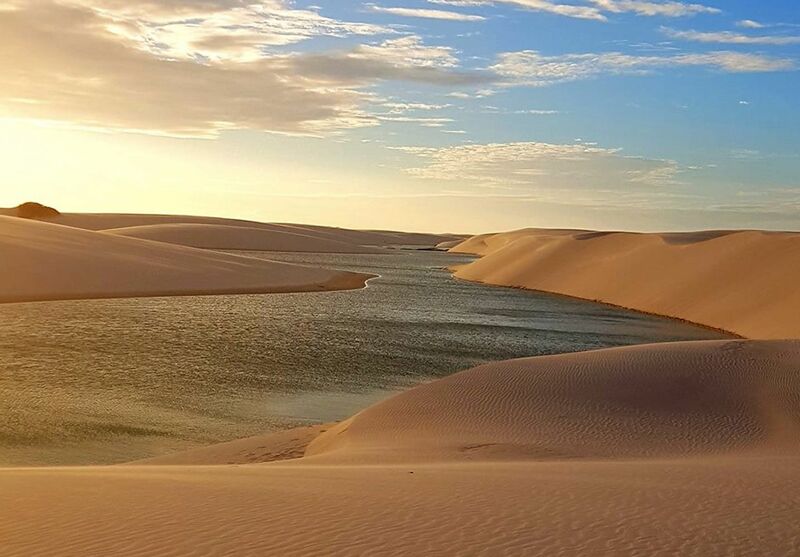 This is because the rainy season having recently finished has left azure blue, fresh water pools in the sand dunes – Lençóis Maranhenses, the area’s main draw card. We started our trip in São Luis the capital of the state Maranhão. A city with a population of just over one million, it has an historic centre and an ample number of beachfront bars. After a quick exploration of the town the perfect way to start off the trip would be to head down to the beach and watch the sun set behind silhouettes of kite surfers whilst sipping a caipirinha. Leaving São Luis, it’s a morning journey to Lençóis Maranhenses National Park. After a quick dip in our Pousada pool, we jumped in the back of a 4×4 to drive to the beautiful Lençóis. 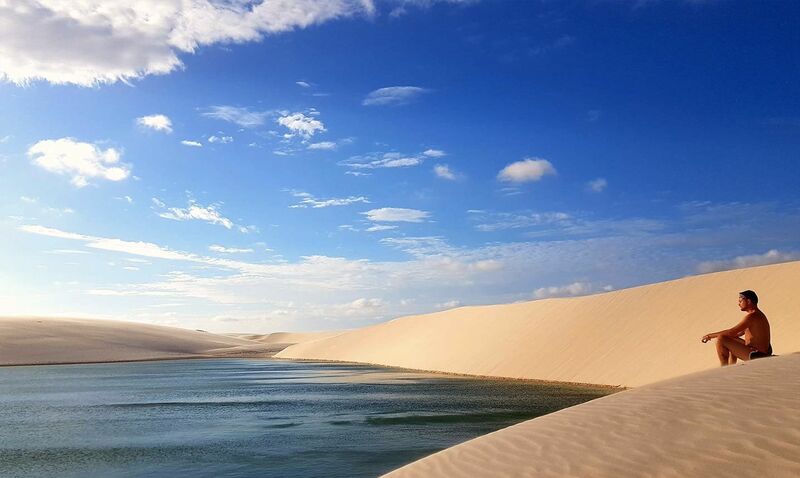 The Lençóis Maranhenses National Park has an area of smooth white sand dunes, constantly changing shape from the wind that blows in from the ocean. After the rains the natural indentations of the dunes fill with fresh water, it’s a spectacular sight. I can’t do it justice in words, but to me, the landscape was like a tropical beach version of the gas swirls on the surface of Jupiter. There’s certainly something outer-space-like about it anyway. The pools themselves were deep enough to swim in, clear turquoise water surrounded by hills of pure white sand. As the sky turned from bright blue to pink to purple we watched the shadows in the wind-blown ridges of the dunes become more defined. It was magic. So, number one attraction over, what on Earth was going to fill up the next few days I thought? Dutifully fulfilling my role as lazy and clueless travel companion I asked Blake. ‘Well’, he said, ‘there’s some other stuff but I don’t think it’s going to top that.’ Perhaps he was trying to talk it down to prevent any disappointment. But I actually think in this case, my favourite travel companion couldn’t have anticipated what was waiting for us. We stayed that night in the town of Barreirinhas. A chilled little place with some lovely and authentic restaurants strung along the river. We were collected the next day for a boat trip along the Rio Preguiças, the river that connects the town to the ocean. Our first stop was a visit to some smaller Lençóis guarded by some spirited and very cute looking monkeys. We were then whisked along the river to the Farol Preguiças, a lighthouse with an impressive view of the area. We finished the day with freshly caught seafood and a cerveja (beer) where the river meets the ocean. I would suggest drinking more than one cerveja as there are some conveniently placed hammocks close by. What more could you need in life? Before we move on from the town of Barrierenhas I do just want to give a little shout out to some of the inhabitants. There’s a lovely little bar with live music (zero 138) which some locals were kind enough to recommend to us. With our bellies full of fresh seafood, off we trotted to sample the nightlife. This was the night I realised that I can’t dance. I’m certainly not accomplished, but show me a dance floor, half a litre of caipirinha and I’m twerking with the best of them**. A very kind local agreed to chaperone us to the local club, along with his lovely friends they all appeared genuinely baffled that neither Blake nor I could manage even one step of the Forro. Anyway, far more confident than was warranted I powered on. I think I stood on the foot of every man (and potentially woman) in the club, but by the end of the night I was the most exhilarated (not to mention sweaty) I think I’ve ever been on a night out. Next stop Paraniba, which Blake had described to me as ‘a place to break the journey’ so it was a surprise to all of us when we had one of our best days along the route. I’m told that you need a 4×4 and a private transfer to get between Barriernehas and Paranaíba. There may potentially be another way, but you’d need a longer period of time and a far better grasp of Portuguese than we had. Paranaíba is a lovely town, cobbled streets, colourful buildings with a laid-back vibe, and as we discovered, plenty of crabs. If you are partial to a crab or two then make a trip to caranguejo express in the cultural centre of Paranaíba. Please order their specialty dish (somewhere between a crab lasagne and omelette) and if you’ve ever eaten more crab in your life then I’d like to know about it. So, reference to all these crabs makes a bit more sense when we were taken out on a speed boat by probably the friendliest skipper in the world. 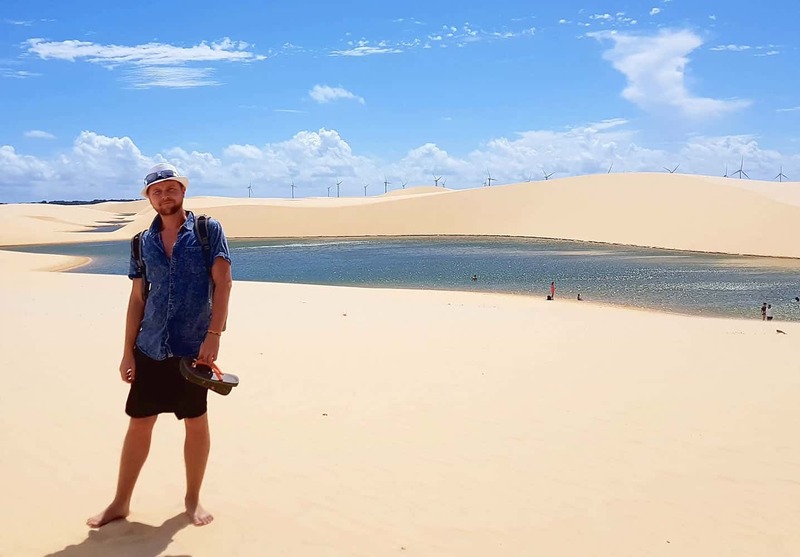 He pointed out the literally thousands of bright orange crabs that live along the banks of the Paranaíba river scuttling back into their holes as soon as we got close. 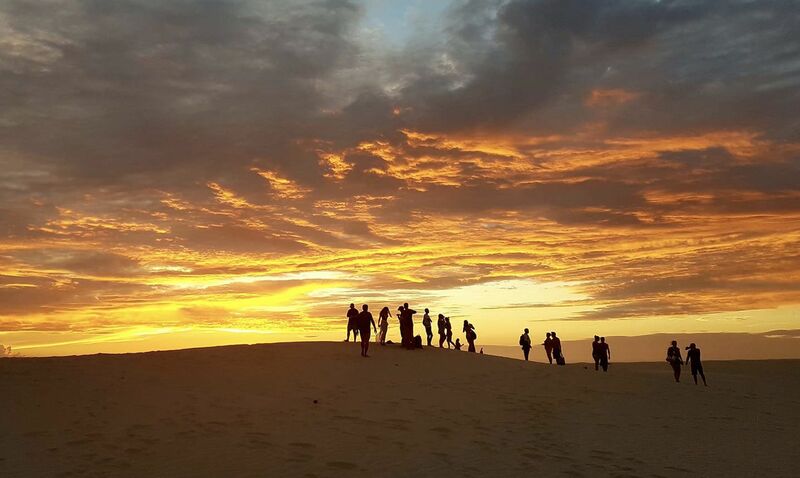 After a bit of wildlife spotting, most notably a fish with four eyes, a can each of Skol in our hands we watched the sun set over the dunes with no one around. It was just us and the crabs, who were quite wisely hiding. Ok, disclaimer on the next bit. I am biased. If you don’t love seafood, beautiful beaches, lying in hammocks in clear blue water drinking cocktails, cruising round in sand buggies then maybe skip this part. Again, the journey from Paranaíba had to be done privately and in a 4×4 and there was a couple of interesting raft crossings (picture a car on a raft and you’ve nailed it). Making the most of any waits we took the opportunity to meet more local friends with our combined four words of Portuguese. Again, we were dazzled by the friendliness of the Brazilians, anyone who has a mega sound system in the boot of their truck and takes it upon themselves to entertain strangers in a queue is a legend in my book. After a drive along the sand on a deserted beach, a lunch of lobsters and a quick snooze in a hammock we arrived at Jericoacoara. Our driver told us the name means crocodile head in the indigenous language because, from a distance the shape of the island resembles one. To me this place looked like paradise. 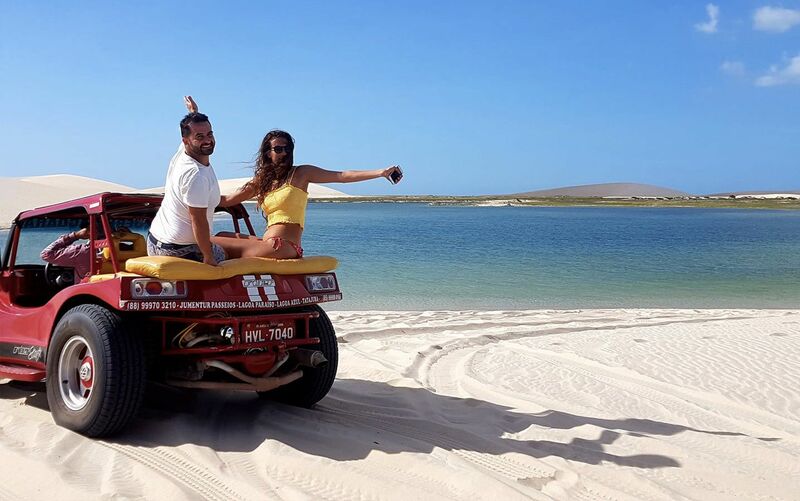 The next two days were spent driving around in dune buggies, eating seafood, drinking cocktails and dancing the Forro (no I still couldn’t do it). If you were to pick one place on this route, this is the one. Go there, you won’t be disappointed. After Jericoacoara it’s a short journey on to Fortaleza where the route ends. Finishing in a city in the same way we started in São Luis. 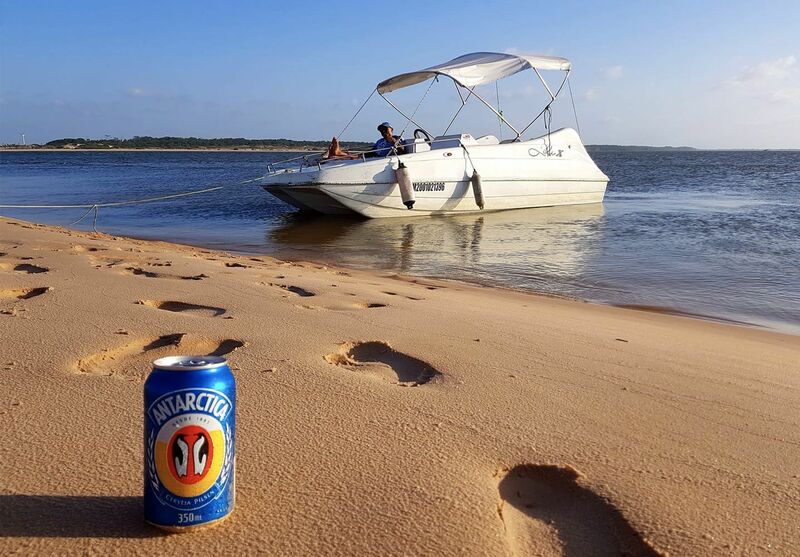 We only had time for one evening before we had to fly back down to Rio, but there were some beautiful beaches and plenty of party vibes if you’ve got any energy and time left after Jericoacoara. At the end of our trip Blake and I talked about how we thought the route of emotions had earned its name. Being oblivious I had failed to do the research and it was also something he’d neglected to read up on. I’ll leave it to you to look it up or come up with your own meaning. Between us we decided that just like emotions themselves, the route was a constant surprise, not to be predicted or controlled, simply to be experienced. Like the beautiful and constant movement of the Lençóis sand dunes, each shift was different but just as beautiful as the last. Anyway, that’s enough of me getting all saudaudes about my holiday. Go and see and feel it for yourselves. ** I can’t actually Twerk, I just think I can. Sorry dad.